Luella Agnes Buchtenkirch, 102 of Midland, formerly of Unionville, died Friday morning, March 24, 2019 at Brittany Manor. Luella lived on this earth for 102 years and 2 days. She passed on to heaven soon after celebrating her 102 birthday with family and friends sending ice cream cake, chocolate-covered strawberries, balloons, flowers, gifts and wishes of love. Luella could “do it all” – farm the fields, supervise construction work and fix things, tend to a husband and three daughters, sew their dance costumes, and bake delicious pies like it was nothing. She called “hard work” the secret to a long life. She will be missed. as well as 13 great grandchildren. Funeral Liturgy will take place 11 a.m. Saturday, March 30, 2019 from the Blessed Sacrament Catholic Church. Fr. Jack Johnson will celebrate with the rite of committal to take place in Columbia Township Cemetery in Unionville. Luella’s family will receive friends at the Ware Smith Woolever Funeral Home, 1200 West Wheeler Street on Friday from 5-7 p.m. and at the church on Saturday from 10 a.m. until time of the service. Those planning an expression of sympathy are asked to consider the Humane Society of Midland County. 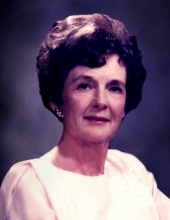 To plant a tree in memory of Luella Agnes Buchtenkirch, please visit our Tribute Store. "Email Address" would like to share the life celebration of Luella Agnes Buchtenkirch. Click on the "link" to go to share a favorite memory or leave a condolence message for the family.